“Who has given the authority to Pradip Dutta Roy to talk about Barak separation? Who is he?" United Front of Former ULFA’s Barak valley wing general secretary Anamul Haque Laskar speaking to reporters in Silchar on Monday. 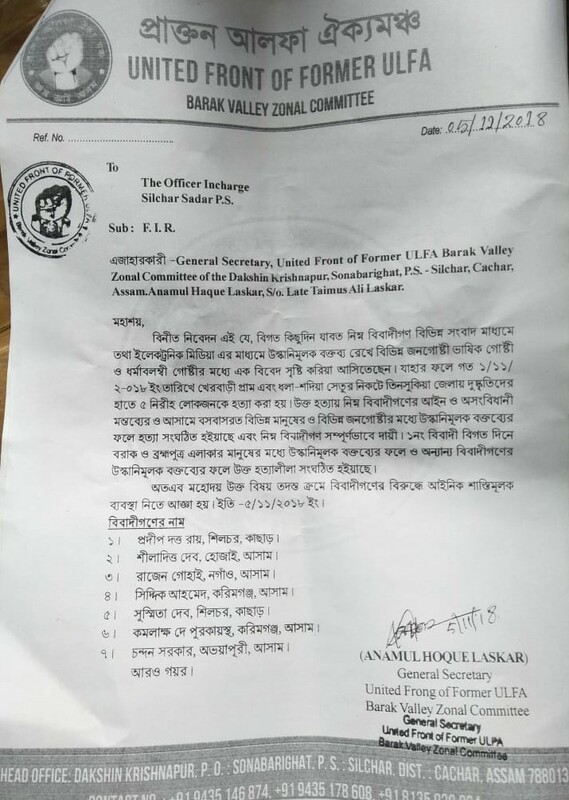 In a significant development amidst the tension over killing of five people in Tinsukia district, the Barak Valley Zonal Committee of the United Front of Former ULFA, an organisation of pro-talk ULFA militants, on Monday filed an FIR against seven political leaders and activists for allegedly making provocative statements. Anamul Haque Laskar, general secretary of United Front of Former ULFA’s Barak valley wing, filed the case against All India Mahila Congress president and Silchar MP Sushmita Dev, Karimganj MLA Kamalakhya Dey Purkayastha, Hojai MLA Shiladitya Dev, Gauhati High Court lawyer Pradip Dutta Roy, Minister of State of Railways Rajen Gohain, Congress leader Siddique Ahmed and Congress leader Chandan Sarkar. Five innocent people were gunned at Kherbari under Dhola police station in Tinsukia district on November 1 by suspected ULFA (I) militants. On the basis of the FIR filed by Laskar, Silchar police registered a case (number 3852/19) against these leaders at Silchar’ sadar thana, under sections 120 (B)/153 (A) of the IPC. “Who has given the authority to Pradip Dutta Roy to talk about Barak separation? Who is he? Let him first make a name for himself then decide to speak on behalf of the people of Barak valley,” said the former ULFA leader. Meanwhile, filing of an FIR against these leaders has sent ripples around the political circles of Barak valley, if not Brahmaputra valley for now.